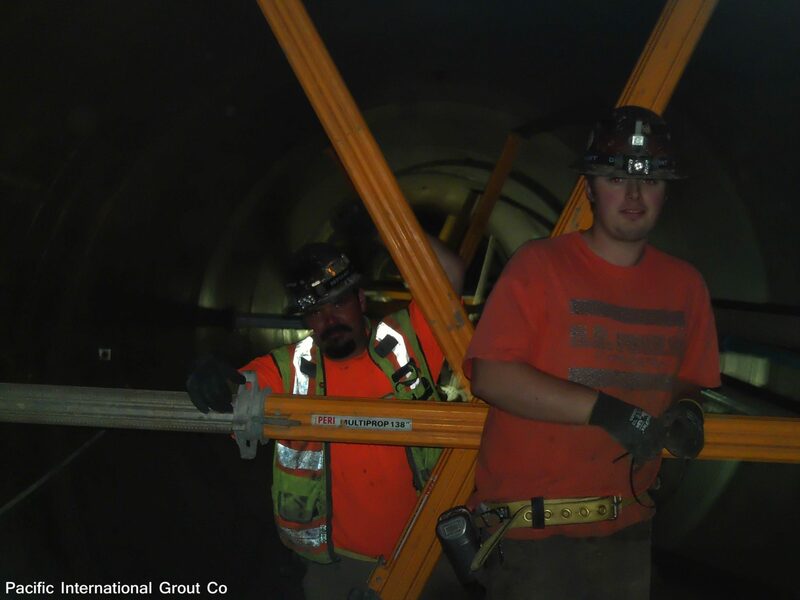 The key to cost-effective tunnel backfill grouting lies in having the equipment to do the job efficiently and personnel who are trained to respond to a wide range of conditions. 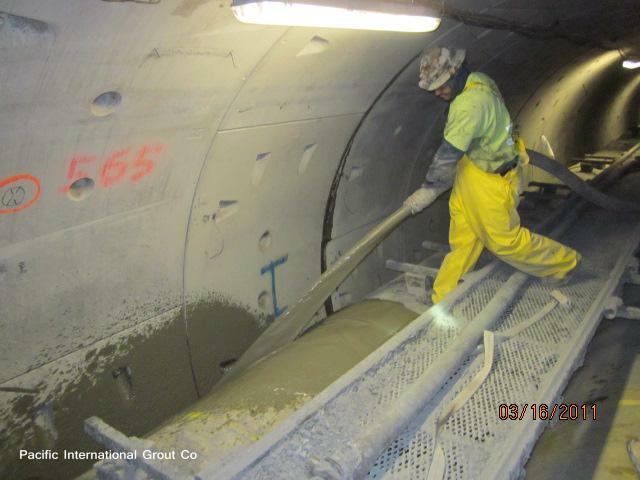 Pacific International Grout Company has continually demonstrated creative excellence in these critical areas, having been granted international patents for materials and process equipment used in tunnel backfill grouting. 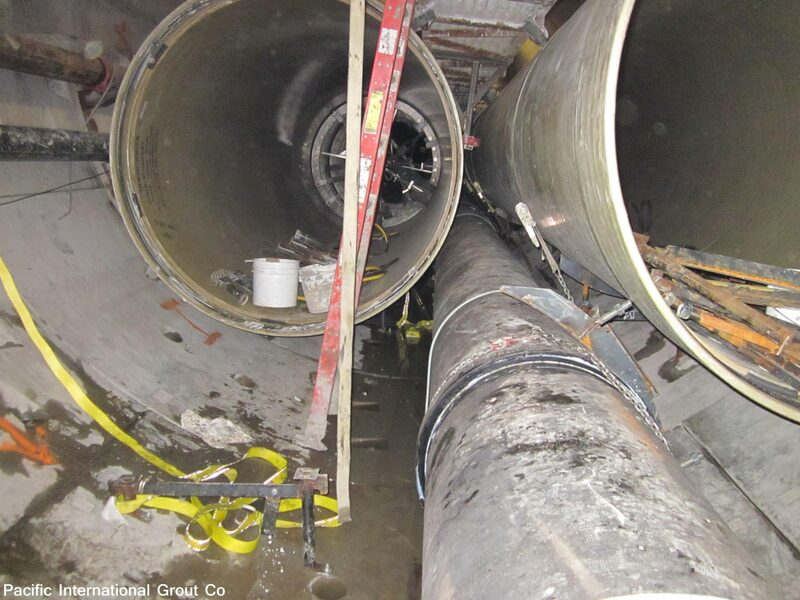 Backfill where pipe buoyancy is a potential problem. 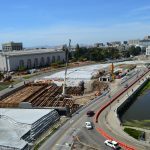 Projects where net cost is an important consideration. 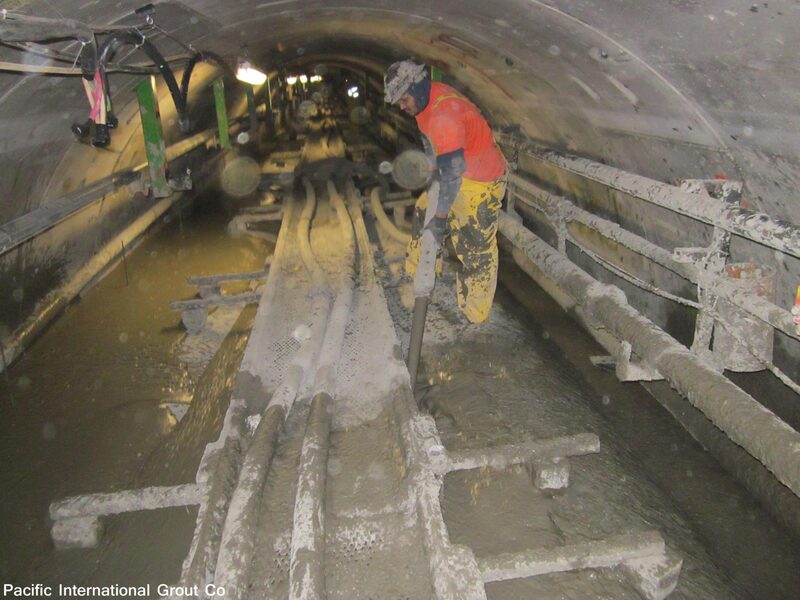 Situations which require energy absorbent backfill material. 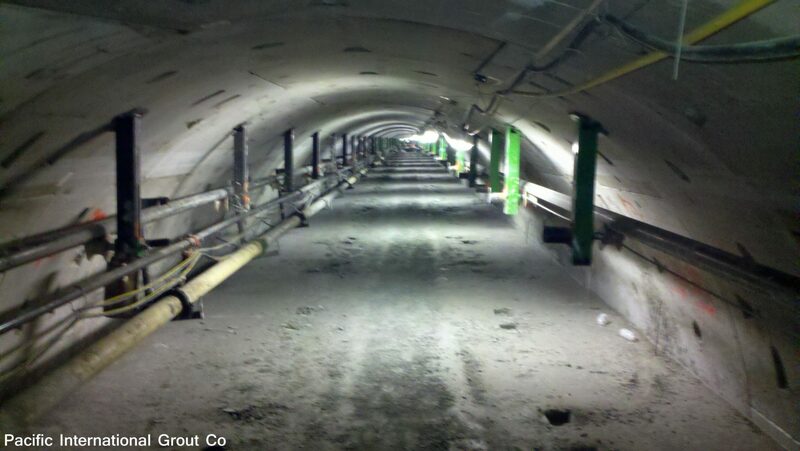 Tunnels with potential safety and air quality hazards. 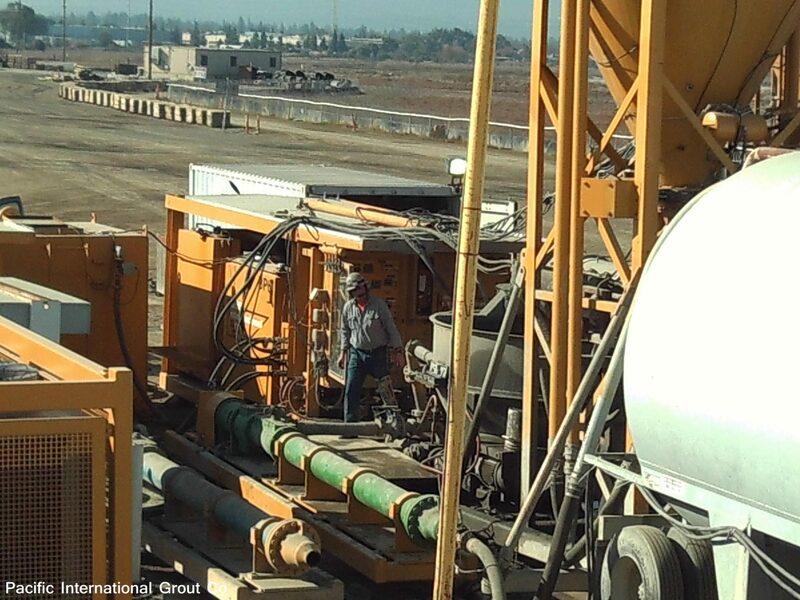 Since 1974, Pacific International Grout Company has been developing and working with cellular grouts and low density concrete. 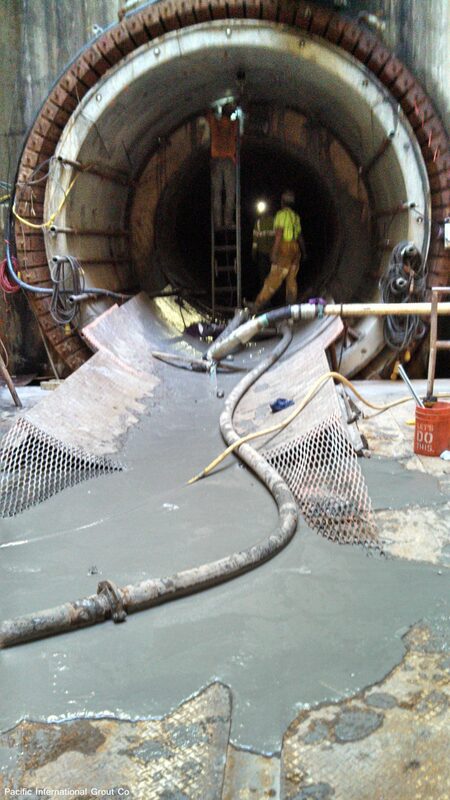 These are ideal materials for tunnel backfill grouting. 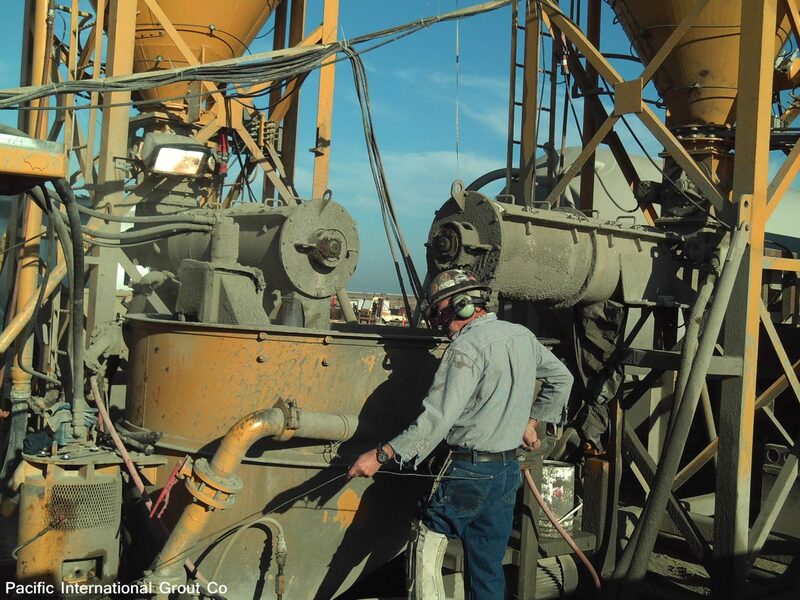 Utilizing common slurry, mixes can be modified on-the-spot to meet a wide range of requirements and conditions. 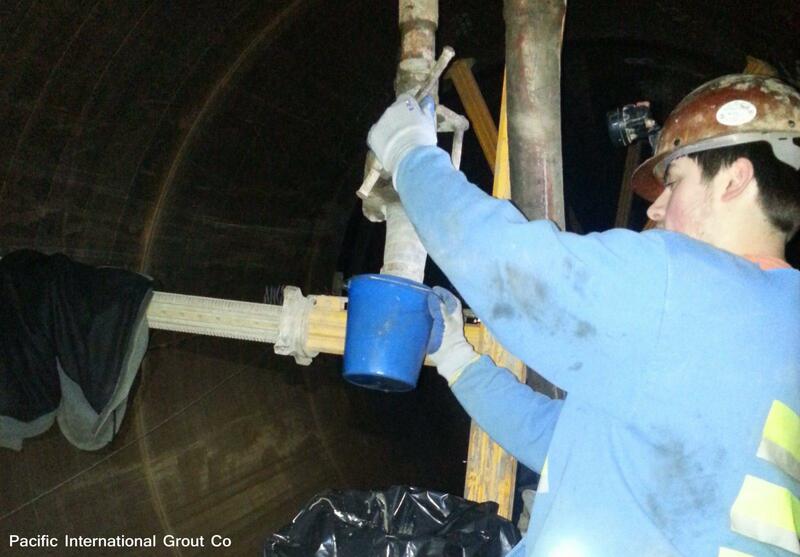 Mix designs are carefully chosen for each project in accordance with the specifications. 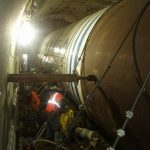 Factors such as void size, ground conditions, pipe support, ground support, or tunnel liner blocking determine the appropriate design. 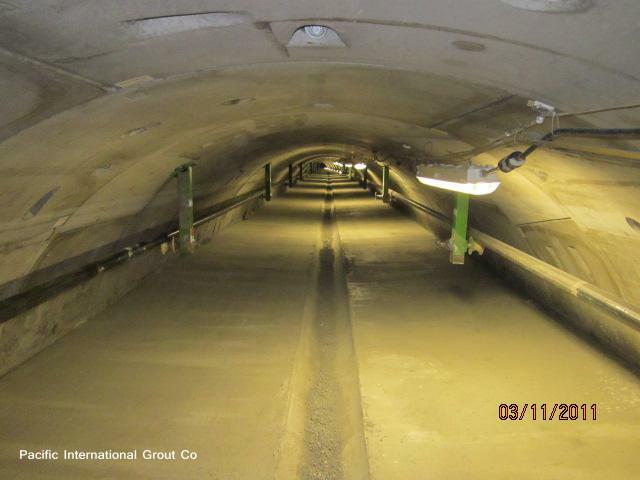 Cellular grouts have a much lower unit weight than conventional backfill concretes and grouts, the use of low density cellular backfill concretes significantly reduces the possibility of pipe flotation, misalignment, or buckling. 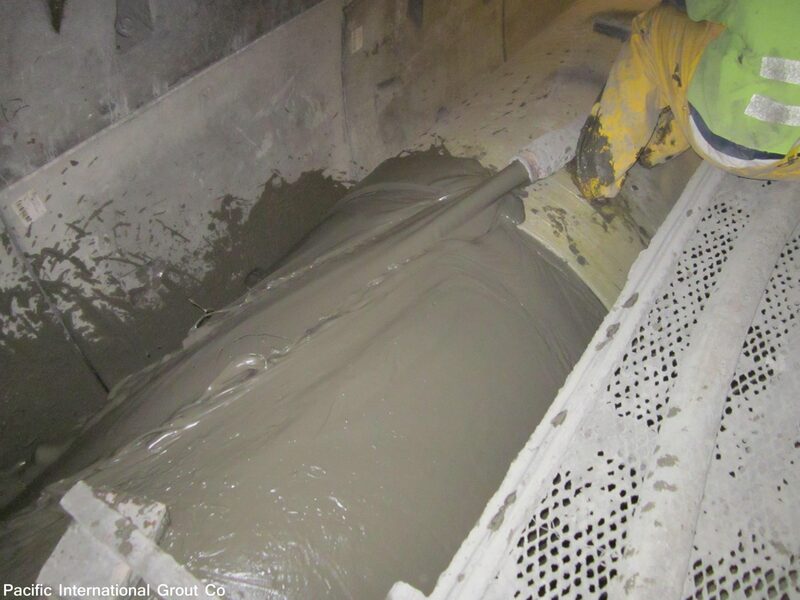 Cellular concrete is particularly flowable. 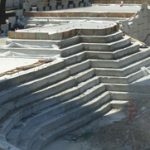 The advancing slope, as it is placed in the annular space, will be nearly level. 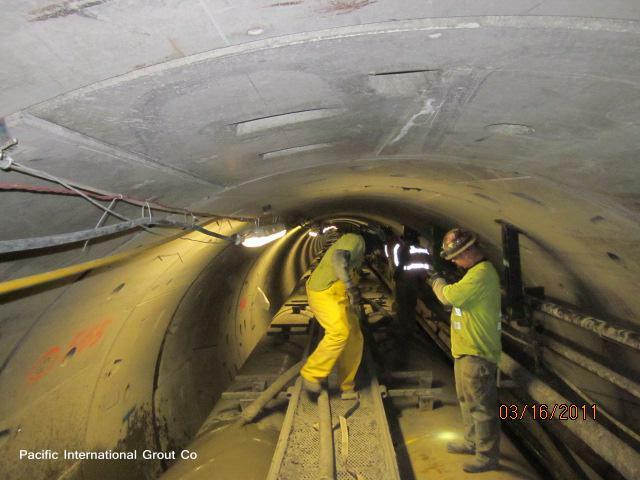 When placed in lifts, final placement in the crown assures that there is no trapped air and voids are eliminated. Injection pressures of less than 4 psi are easily maintained. 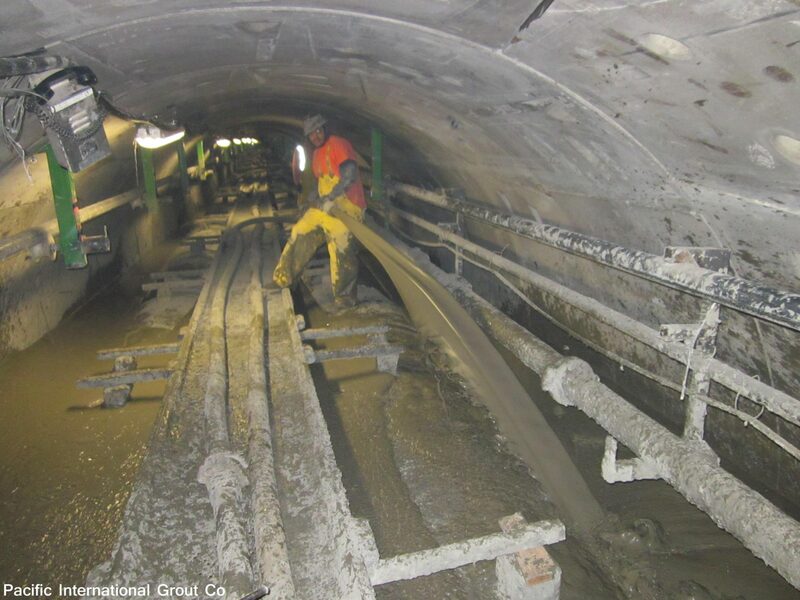 In addition, low density cellular concrete backfill is extremely energy absorbent, protecting finished tunnels from seismic ground movement or surface load pressure. 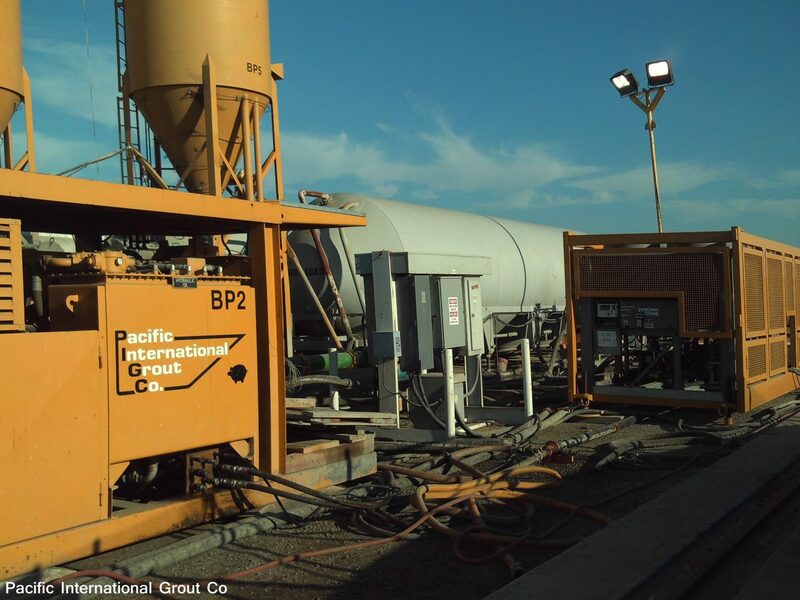 Pacific International Grout Company has developed and built an assortment of proprietary machines to accommodate the placement of low density backfill concrete for underground tunnel construction and void fill. 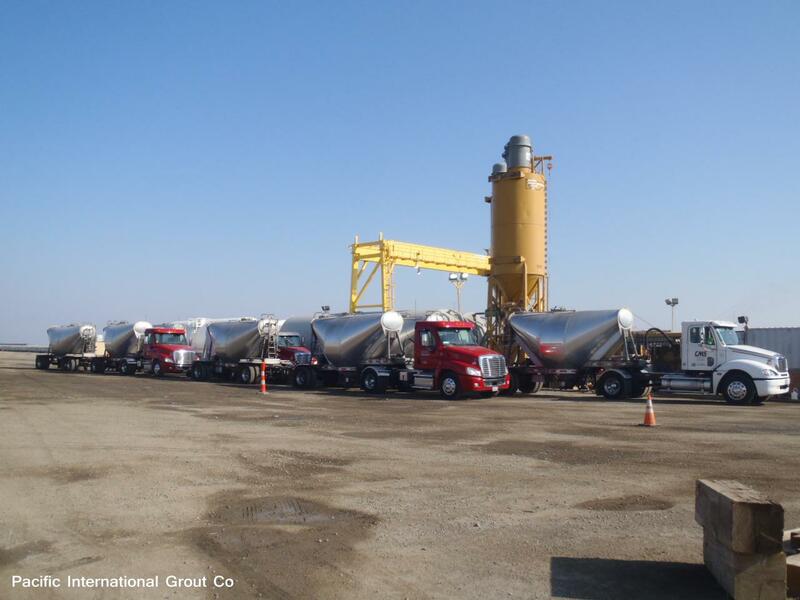 The processing equipment is designed for delivery via 40-foot conventional flatbed trailers. 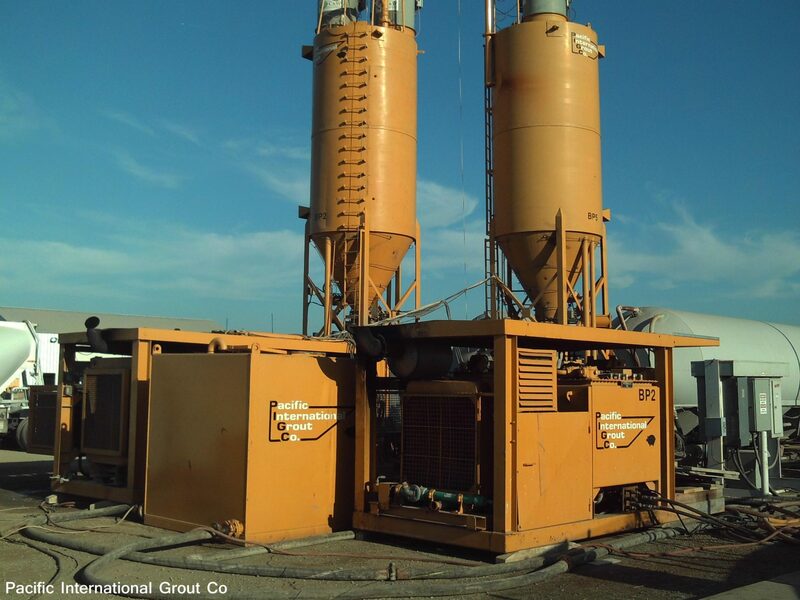 These portable continuous grout plants are capable of batching and injecting low density cellular concrete backfill at rates of over 100 cubic yards per hour, at distances over 10,000 feet, while maintaining precise control over grout quality and placement location. 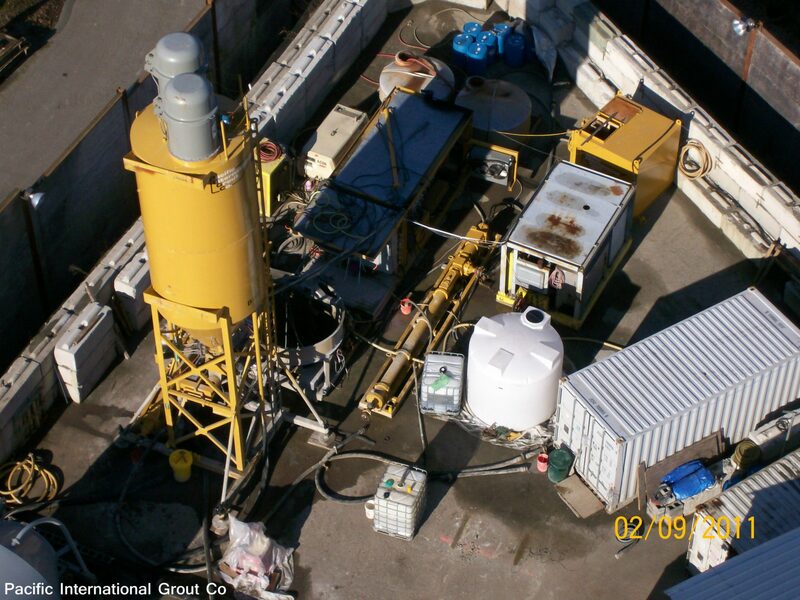 Our state-of-the-art equipment results in high quality backfill concrete at very economical costs. 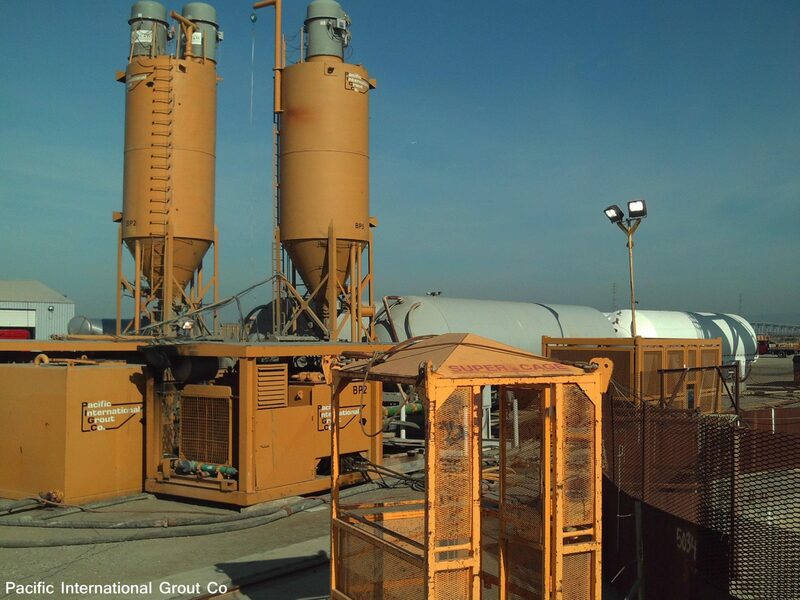 Depending on the size of the project, material can be batched on-site or delivered in ready mix trucks. 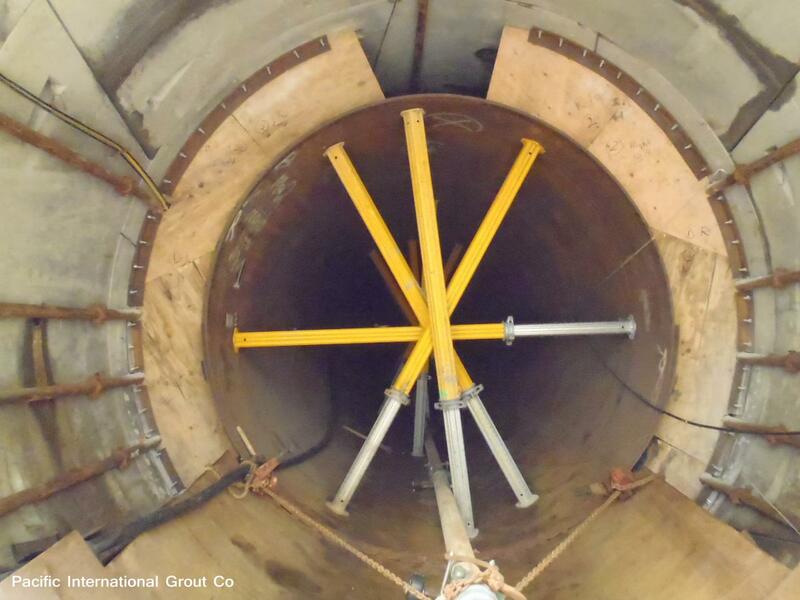 This proprietary process allows for continuous pipe placement in the tunnel while backfilling the annulus from the opposite end. 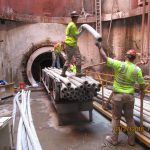 There are significant cost savings when compared with traditional methods, which require stopping, bulk heading, grouting, stripping, and placing the next section of pipe and so on. 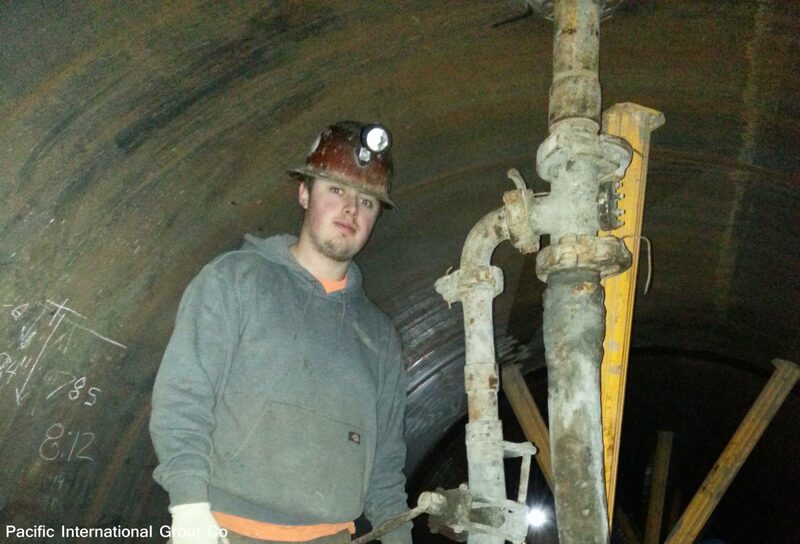 Production schedules are more attainable since the efficiency of placement is greatly improved. 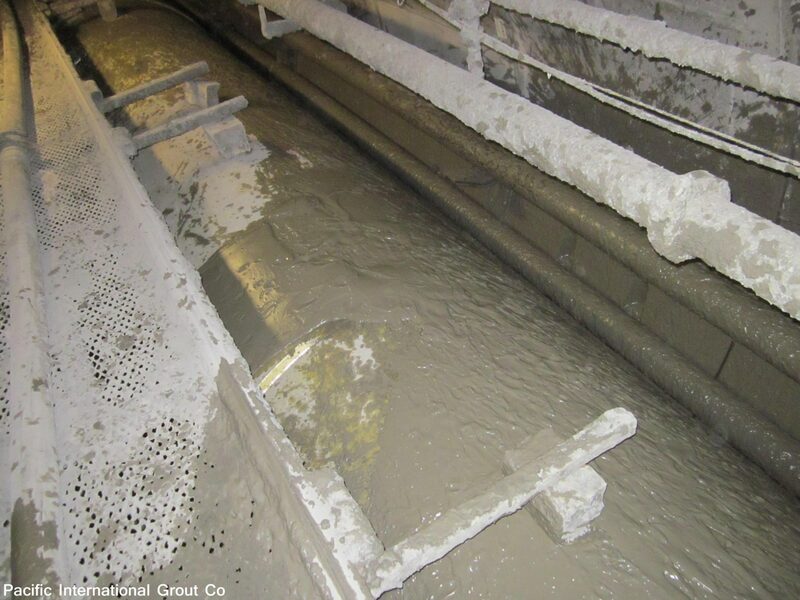 Once a mix is determined, maintaining quality control at the point of placement is a simple function of checking unit weight and dialing in a correction if necessary. 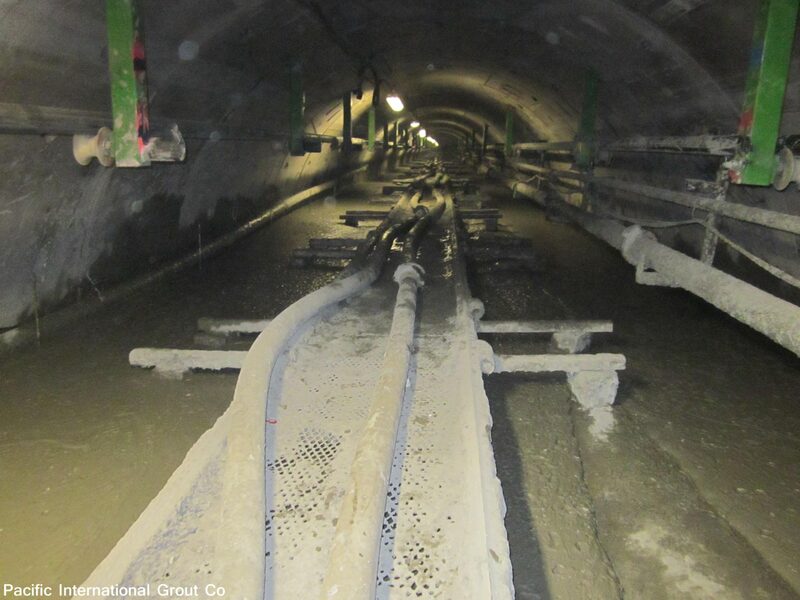 For example, if ground water is discovered at a location in the tunnel, the density of the grout can be increased at the point of injection by simply dialing in a unit weight greater than that of water without stopping. 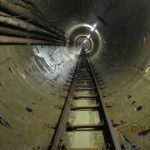 This can be especially significant when it occurs 10,000 feet inside a tunnel with as much as 30 cubic yards of slurry in the slickline. Due to the high and continuous production rates, precise control of the density, average unit weights plus or minus 1 pcf can be maintained. 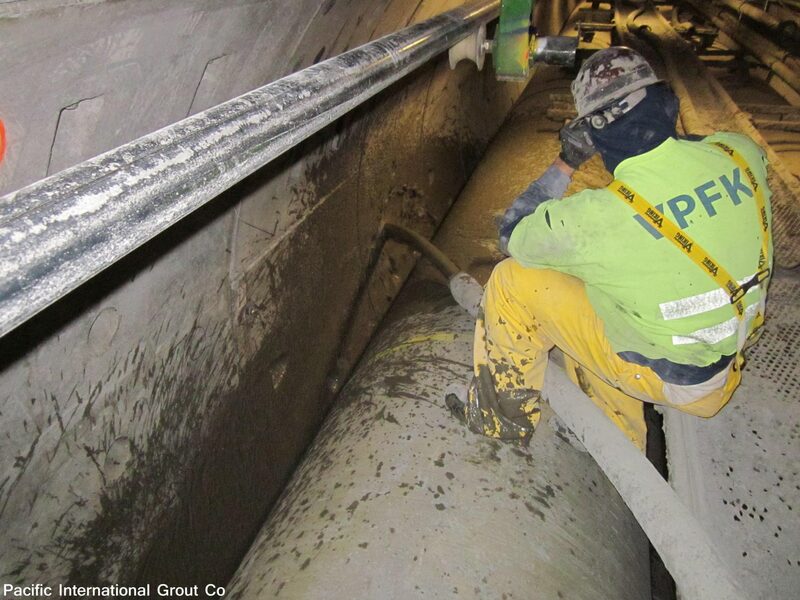 Quality can be monitored at the slurry plant and inside the tunnel at the point of injection. 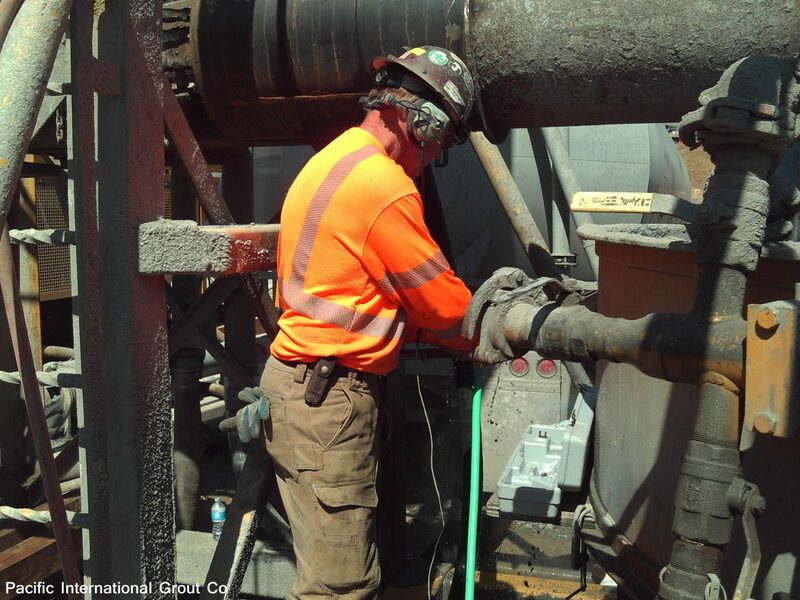 Unit weight and density is easily maintained or modified as needed. 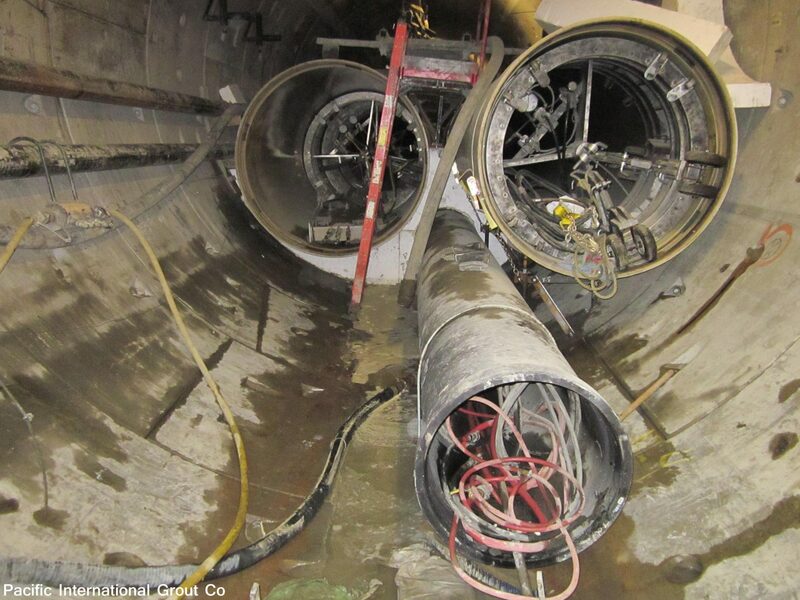 This results in a higher quality product while significantly reducing the cost and increasing speed of installation. 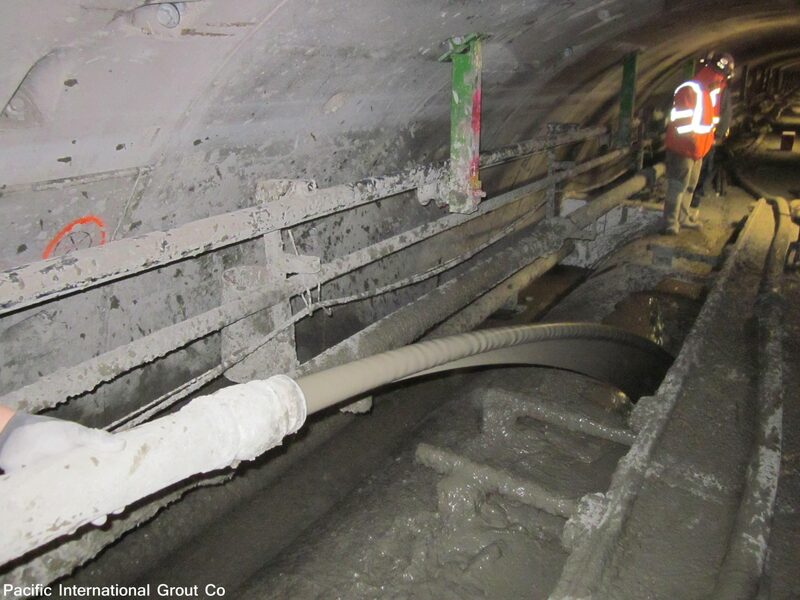 An added benefit of this procedure is the ability to maintain improved ventilation and air quality in the tunnel due to the speed with which the work can be completed. 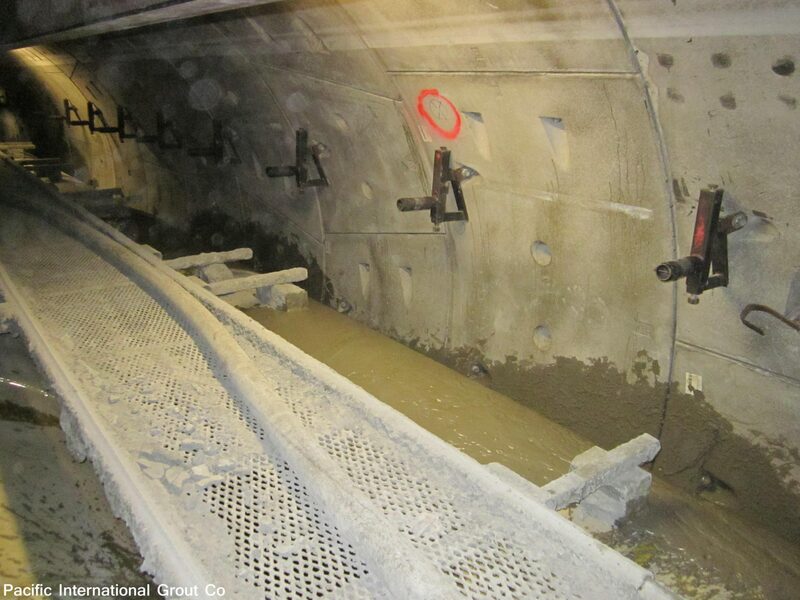 No dry mixing is done in the tunnel which makes working conditions much safer. 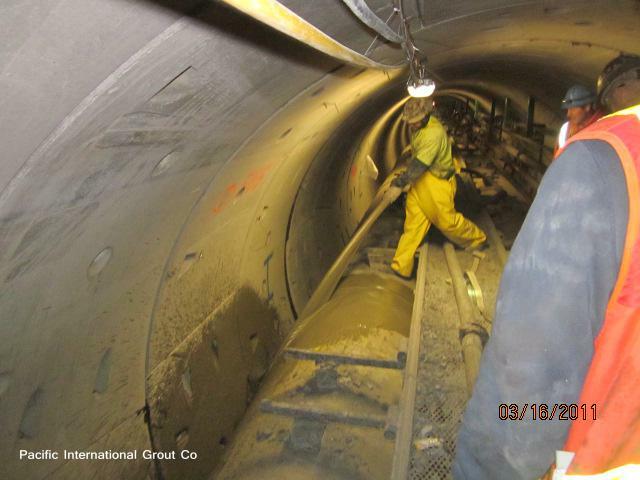 Pacific International Grout Company has a widely-recognized reputation of devising methods for the tunnel backfill grouting that save our clients’ time and money. 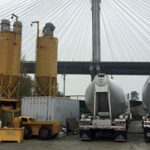 Our ability to adapt quickly and create material and delivery systems that meet the demands of specific job requirements is widely recognized by engineering firms with whom we have worked.